As I mentioned in my last post on this topic, one way that we can estimate how long period woodworkers took to build their furniture is to look at old surviving account books from the old shops. The table below is one that was built by Nathaniel Dominy in 1796. The table is currently in the collection at the Winterthur museum, along with the reconstructed Dominy workshop. 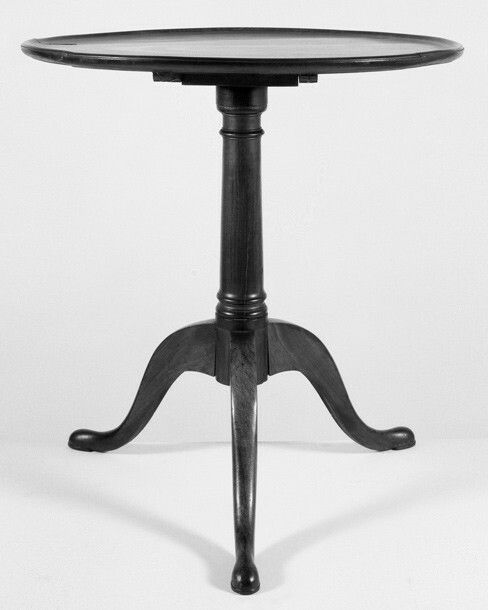 Mahogany tilt top tea table built in 1796 by Nathaniel Dominy (Courtesy, Winterthur Museum). From the surviving account books of the Dominy shop, it is estimated that it took a mere 9 hours to complete this mahogany tilt top tea table, including a glued up (2 piece) turned top AND the finishing. Of course this was all accomplished with hand tools and a great wheel lathe. But I don’t care what kind of tools you use – that’s fast. Posted in Antiques, Random Thoughts and tagged efficiency with hand tools, tea table.